THE LATEST WAVE OF BLACK GENIUS: Veronica Chambers' piece, "The Latest Wave of Black Genius," is my all-time favorite on The Root . I actually brought it up during my job interview to work here. 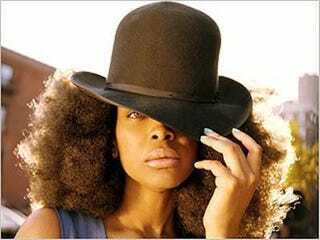 Since I'm a big Erykah Badu fan, the image of her with her oversized afro sticking out of a large, floppy hat just grabbed me. I had heard of several people on the list, but some of them, not so much. Veronica's hyperlinks throughout the piece — and there were several — provided great profiles. Erykah Badu, Marcus Samuelsson, Thelma Gordon and Majora Carter in one piece? Priceless. SMELLS LIKE 'TEENTH SPIRIT: My own favorite piece for The Root was my first one, "Smells Like 'Teenth Spirit." A couple of days before Juneteenth, we were scrambling here at the office to do something about this black holiday. Even as a native Texan, I didn't think I had too much to say about the celebration. So I called up my mom and got to typing. I turned around the piece in one night, and surprisingly, I had a lot more to say than I thought. My mom celebrates Juneteenth every year and had many unique insights about the holiday, so the piece became a sort of generational dialogue. Erin Evans is a writer and copy editor for The Root.